This tutorial will help you get started using the ITG-3200 in your next project. We will cover the hardware, discuss the code briefly, then show you how to hook it up to a microcontroller. This tutorial builds on some basic concepts. If you are unfamiliar with any of the topics below, go ahead and check them out. We'll be right here waiting. The ITG-3200 can be powered at anywhere between 2.1 and 3.6V. For power supply flexibility, the ITG-3200 has a separate VLOGIC reference pin (labeled VIO), in addition to its analog supply pin (VDD), which sets the logic levels of its serial interface. The VLOGIC voltage may be anywhere from 1.71V min to VDD max. For general use, VLOGIC can be tied to VCC. The normal operating current of the sensor is just 6.5mA. Communication with the ITG-3200 is achieved over a two-wire (I2C) interface. The sensor also features a interrupt output and an optional clock input. In the next picture, you can see a small jumper next to the pin labeled 'CLK.' The ITG-3200 has a feature that allows you to connect an external clock. Unless you plan to use an external clock, you need to 'close' this jumper by connecting the two pads with solder. If you're following this tutorial and using the provided example code, go ahead and close the jumper. Make sure you close this jumper with solder if you're NOT using an external clock source. A jumper on the top of the board allows you to easily select the I2C address, by pulling the AD0 pin to either VCC or GND; the board is shipped with this jumper tied to VCC. Note that there are two unpopulated pull-up resistors on the I2C lines. These can be added later by the user if desired. Here the I2C address jumper (top) and the unpopulated I2C pull-up resistors (bottom) are highlighted. 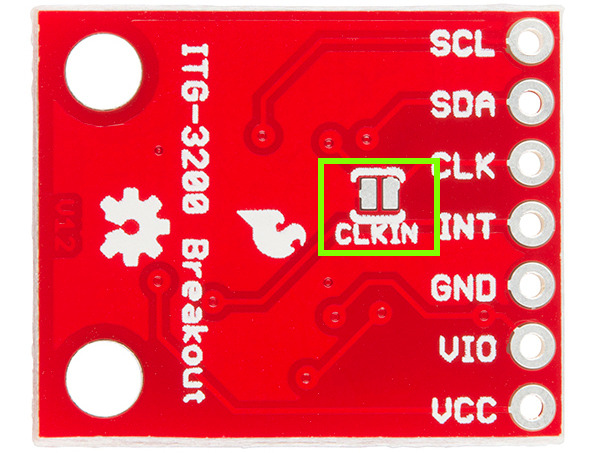 There are only two considerations for assembling the ITG-3200 breakout: what to do for the headers, and whether or not you're going to use an external clock source for the ITG-3200. For the headers you have a couple options, you can solder in male or female 0.1" headers, or you can just solder wires directly to the holes in the breakout board. In this example, male headers are soldered to the breakout board to make it easy to attach to a breadboard. Then, we'll be hooking the ITG-3200 up to an Arduino Leonardo using some male-to-male jumper wires. Second, since we will not be using an external clock source in this setup, make sure the CLKIN jumper on the bottom of the ITG-3200 is closed with a blob of solder. Here's everything all hooked up. 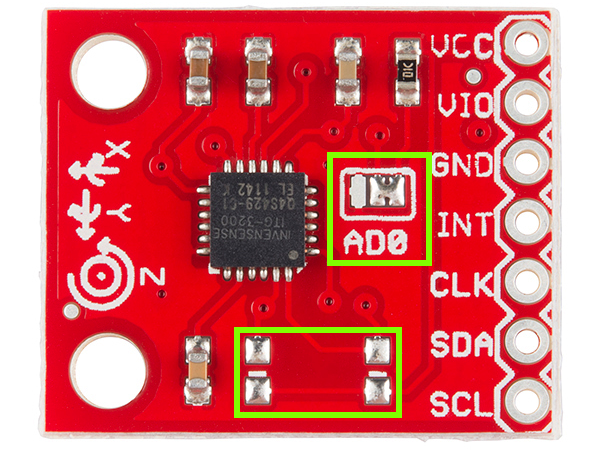 Make sure you add the small jumper from VDD to VIO to ensure they are both connected to 3.3V. The SDA and SCL pins should be present on most Arduinos. Older, pre-rev3 Arduinos might not have SCL and SDA pins. In that case, connect SDA to A4 and SCL to A5. The ITG3200 sensor is a 3.3V device. This means that the sensor should be powered by 3.3V and the communication signals should be between 0V and 3.3V. The Arduino Leonardo (and other similar boards) are 5V devices. Even though we power the board with the 3.3V output from the Arduino, the communication signals are still going to be 5V. Technically this should be avoided as it can cause damage to the sensor in the long run. When implementing this gyro in a final project, it's in your best interest to use something like a Logic Level Converter to change the voltages of the communication signals. You could also use an Arduino Pro (3.3V/8 MHz). However, for the purposes of testing out your gyro, using a 5V device should work fine. That's all there is to it! Now, let's look at some code to get this gyro up and running. We're finally ready to start looking at the firmware. We've written an example Arduino sketch to help you get started. You can download firmware from the ITG-3200 GitHub page. The sample sketch reads the gyroscope data for the X, Y, and Z axes and prints it to the serial port. This is raw gyroscope data, and it has not been converted to degrees per second yet. Bigger numbers mean the device is rotating faster. Positive numbers indicate one direction of rotation while negative numbers indicate the opposite rotation direction. Since this is a triple-axis gyroscope, we can measure the rotational rate of the board no matter which way the board is rotating. Rotation is usually measured in degrees per second. If the board spins around an axis exactly one time in a second, the gyroscope would measure 360 degrees per second. Now, let's break up the code in to sections to go over what's happening a little more in depth. This is the configuration section of the sketch. It looks more complicated than it is! First we include the "Wire.h" library, which comes standard with the Arduino IDE. This library is used for I2C communication, which is the communication protocol used by the ITG-3200. Next, there is list of variables which are assigned to different registers on the ITG-3200. Registers are used mostly to do two things: configure parameters for a sensor, or hold data that the sensor has collected. When we want to interact with a sensor's register, we must tell the sensor which register address we want to work with. After the list of registers is a short list of register parameters. This is only a list for the parameters used by this sketch. There are many more parameters listed in the ITG-3200 datasheet that aren't used in this example. Finally, after the list of parameters, is the itgAddress variable. This is the I2C address of the ITG-3200. 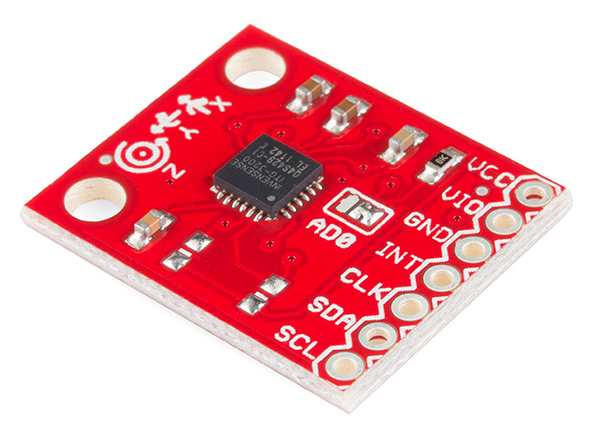 The I2C address for the sensor is also listed in the datasheet. Remember, this address is directly impacted by the configuration of the solder jumper on the top of the PCB. The Setup section of the code is pretty short. First, we create a Serial connection so that we can print data to a terminal window. Then we initialize the I2C communication protocol. Now the Arduino is ready to start interacting with the ITG-3200. Most sensors have some kind of identification register. A good way to verify that the communication is working properly is to read the identification register and ensure the result is valid. After reading the identification register a couple of values are written to some registers on the ITG-3200 to configure the gyroscope to read data at 100hz and measure rotation rates up to 2000 degrees per second. The itgRead and itgWrite functions will be explained a little later. Once the device has been configured the actual gyroscope data can be read. The Loop section of the code is usually the 'meat' of the sketch, in this case the loop is very straightforward. The sketch reads the X, Y, and Z gyroscope values using the readX(), readY() and readZ() functions. After storing these values, they are printed to the serial terminal. We delay 10 ms at the end of the loop so that we don't try reading information from the sensor faster than it can be provided. For the Setup and Loop sections of the code to look so simple we had to use a couple of functions, let's see how the functions work. There are five functions in this sketch, but three of them are very similar. The first function, itgWrite(), is used to write a value to a register on the ITG-3200. To use this function three parameters must be provided: the address, the registerAddress, and the data. The address is the I2C address of the sensor. As it turns out, more than one sensor can be connected to theI2C pins at the same time. In order for the sensors to know who is supposed to be getting the data, they each have a unique address. That's what we're providing with the 'address' parameter. The second parameter is the registerAddress. Like we discussed earlier, most sensors have a set of registers, and each register has it's own address. The last parameter is the data to be written to the address. We can configure a parameter on a sensor by writing data to a register address. The next function is the itgRead() function. This function allows us to read the data stored in the register of a sensor. The itgRead function requires two parameters, and it returns a character value. The parameters are similar to those in the itgWrite() function; the address is the I2C address of the sensor we want to read from, and the registerAddress is the address of the register we want to read. The function will send the contents of the register back. 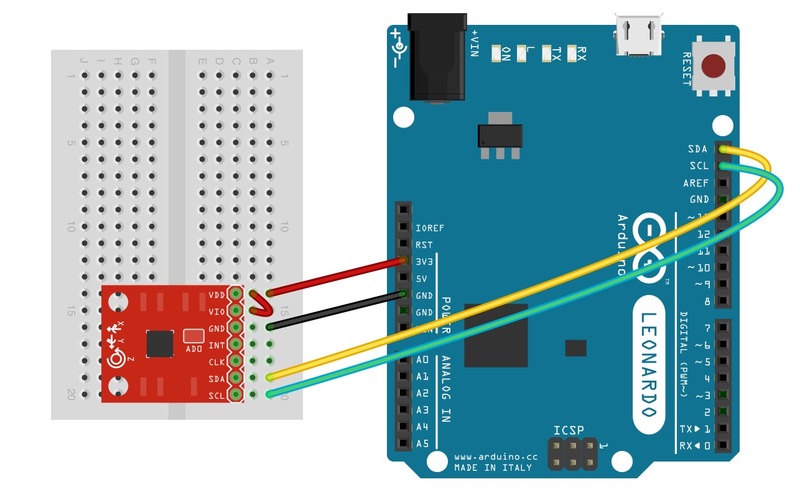 Once you've connected the ITG-3200 breakout board to the Arduino you can upload the ITG3200 Basic Arduino sketch. To see the data from the gyroscope, just open the serial terminal with a baud rate setting of 9600. You'll see values start streaming through the terminal window almost immediately. On each line of the terminal, there are three values: x, y, and z rotation values. Remember, we didn't convert this data to degrees per second so the values that are being streamed are the ADC values from the ITG-3200. You may also notice that even if the gyroscope is sitting still (not rotating in any direction) the values aren't reporting 0. This is because there is an inherent bias in the gyroscope. To get accurate measurements you'll need to calibrate the readings. You can do this in the sketch by reading the values output from the sensor while it is sitting still and storing them into some variables. Then later, when the sensor values are being read, just offset the readings by the calibration values. You should now have a good understanding of how the ITG-3200 works. Now get out there and make some cool projects! If you need more info on the ITG-3200, make sure you check out the datasheet. Want to learn more about gyroscopes? Check out our buying guide to learn about all the variteies SparkFun carries.